Childebert II (570–595) was the Merovingian king of Austrasia, which included Provence at the time, from 575 until his death in 595, the eldest and succeeding son of Sigebert I, and the king of Burgundy from 592 to his death, as the adopted and succeeding son of his uncle Guntram. When his father was assassinated in 575, Childebert was taken from Paris by Gundobald, one of his faithful lords, to Metz (the Austrasian capital), where he was recognized as sovereign. He was then only five years old, and during his long minority the power was disputed between his mother Brunhilda and the nobles. Chilperic I, king at Paris, and the Burgundian king Guntram, sought an alliance with Childebert, who was adopted by both in turn. Because Guntram was lord of half of Marseille, the district of Provence became a centre of a brief dispute between the two. Guntram allied with Dynamius of Provence, who instigated the canons of the Diocese of Uzès to elect their deacon Marcela, as bishop in opposition to their already-elected bishop Jovinus, a former governor of Provence. While Jovinus and Theodore, Bishop of Marseille, were travelling to the court of Childebert, Guntram had them arrested. Dynamius, meanwhile, blocked Gundulf, a duke of an important senatorial family and Childebert's former domesticus, from entering Marseille on behalf of Childebert. Eventually he was forced to yield, though he later arrested Theodore again and had him sent to Guntram. Childebert replaced him in Provence by Nicetius (585). Despite his revolt, Childebert formally restored Dynamius to favour on 28 November 587. But with the assassination of Chilperic in 584 and the dangers occasioned to the Frankish monarchy by the expedition of Gundoald in 585, Childebert threw himself unreservedly into the arms of Guntram. By the Treaty of Andelot of 587, Childebert was recognised as Guntram's heir, and with his uncle's help he quelled the revolts of the nobles and succeeded in seizing the castle of Woëwre. Many attempts were made on his life by Fredegund, wife of Chilperic, who was anxious to secure Guntram's inheritance for her son Clotaire II. On the death of Guntram in 592, Childebert annexed the kingdom of Burgundy, and even contemplated seizing Clotaire's estates and becoming sole king of the Franks. He died, however, in 595. 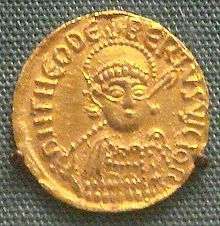 Childebert II had relations with the Byzantine Empire, and fought on several occasions in the name of the Emperor Maurice, against the Lombards in Italy, with limited success. He had two sons: the older being Theudebert II who inherited Austrasia with its capital at Metz, and the younger being Theuderic II who received Guntram's former kingdom of Burgundy, with its capital at Orléans. ↑ Merovingian Gaul and the Frankish conquests, Raymond Van Dam, The New Cambridge Medieval History: Volume 1, C.500-c.700, ed. Paul Fouracre, Rosamond Mac Kitterick, (Cambridge University Press, 2005), 204. ↑ Merovingian Gaul and the Frankish conquests, Raymond Van Dam, The New Cambridge Medieval History: Volume 1, C.500-c.700, 204. ↑ Ian Wood, The Merovingian Kingdoms, (Longman, 1994), 167-168. 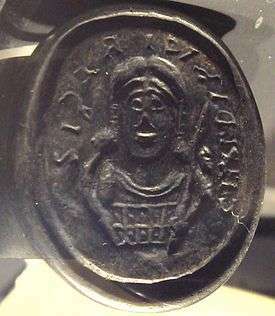 Wikimedia Commons has media related to Childebert II. This article incorporates text from a publication now in the public domain: Christian Pfister (1911). "Childebert". In Chisholm, Hugh. Encyclopædia Britannica (11th ed.). Cambridge University Press. This article is issued from Wikipedia - version of the 2/9/2016. The text is available under the Creative Commons Attribution/Share Alike but additional terms may apply for the media files.